Does the recent explosion of MOOC’s into the education marketplace threaten to destroy traditional post-secondary educational institutions in it’s path? Or is it just another fad in a long history of educational movements to fade into history. The lecture is supposed to be dead, but then why are TED talks and SXSW conference sessions so well attended? These fast moving educational technology initiatives neglect to the take the time to build on the fundamental research supporting active learning and the basic understanding of scientific research into the human brain. 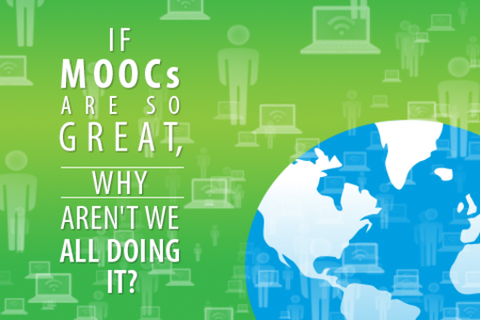 Join us for an interactive conversation about the future of MOOC's and post-secondary education. As Director of the Teaching Centre I have had the opportunity to be involved in a number of educational projects at the local, provincial and national level. My position allows me the opportunity to engage Scholarship of Teaching and Learning activities focused on improving teaching at both the k-12 and post-secondary level. To date my research interests have included enhancing post secondary teaching, the impact of educational technology on teaching and student learning, and 21st century learning environments. I have been teaching at all levels of education for 12 years as well as working with other teachers and Post-Secondary Faculty in helping to improve their teaching. Much of my experience is in the area of technology rich teaching and learning and I am constantly looking at new ways to engage students in the learning process. My role with the Teaching Centre allows me to keep up to date with the educational trends but to also work with Faculty and research the efficacy of these trends in classroom with students.